Sliced thin with flecks of dill peeking out, the salmon looks like any other of gravlax you would have for brunch. But put it on a bagel with a schmear of cream cheese, and you will get pretty stoned eating this delicacy. 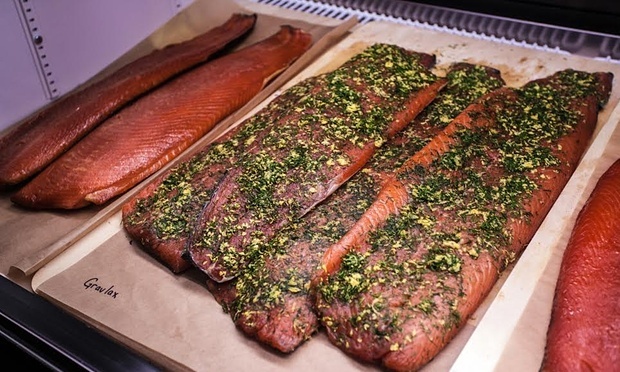 The mastermind behind the THC infused salmon – cured in salt, dill, lemon, sugar and a weed tincture – is Josh Pollack, owner of Rosenberg’s Bagels and Delicatessen in Denver. “I love bagels and lox, and I love cannabis,” Pollack said. Pollack, a New Jersey native who grew up going to establishments like Russ and Daughters, moved to Colorado for college. He loved the state, but missed the bagels from back east. After graduating, he worked in finance for a while, but tired of that and moved on to a more fulfilling passion: food. It was tough to find his favorite comfort food, so specific to the New York and New Jersey area, in Denver. So last year, Pollack opened Rosenberg’s Bagels and Delicatessen to serve up classics like bagels and lox. The idea to infuse salmon with a weed tincture came about as a “fun little thing to do” for the 4/20 “stoner holiday”, as Pollack called it, earlier this year. It was a hit. 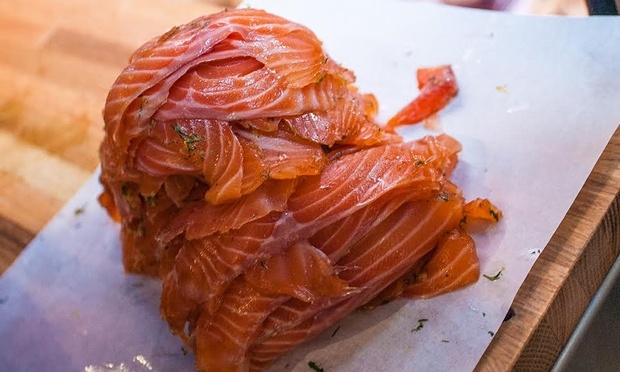 The first batch of THC-infused salmon, which Pollack and his team passed out to people at a 4/20 event, was a little strong, making it difficult for people to eat a whole bagel covered in the stuff. Through trial and error, Pollack and his team at Rosenberg’s have figured out the right proportion of weed to salmon. According to Colorado marijuana regulations, edibles sold recreationally must be wrapped individually or distributed in increments of no more than 10 milligrams of activated THC. To meet this law, which Pollack said is a “safe point” for most people, every three ounces of fish – the ideal serving amount for a bagel – should contain 10 milligrams of the tincture. Pollack is still in the process of perfecting the dish, and said he has gotten more calculated each time they make a batch. Pollack can’t currently sell the special salmon, but once he perfects the proportions, he hopes to sell it through local dispensaries. Unlike other edibles, salmon is “not a particularly shelf stable product”, so he said he will likely sell it on a special order basis. The process of giving the salmon what Pollack calls a “tiny herbaceous flavor” is similar to the way he cures all the salmon for his delicatessen. First he makes a tincture by soaking weed in strong alcohol, straining it out and cooking the alcohol out of the remaining green liquid without activating the THC. Then, he adds the tincture to the recipe used for the cure recipe the delicatessen uses on all gravlax – a mixture of spices and a little bit of alcohol that acts as a retaining agent. The salmon dries in the fridge for 72 hours to let the flavor disperse throughout the flesh and form a hard outer shell, and is then topped with lemon and dill. “With this application, it goes really well to appropriately mask the flavor of the cannabis,” Pollack said. He said people like it because most edible products are brownies or candies – sweets filled with sugar that don’t really hide the flavor of cannabis, which not everyone likes. Savory items infused with weed, though on the rise, are still rare. Now, Pollack is working on a new batch of gravlax for the Harvest Gathering, a Jewish food event in Colorado at the end of September, where he plans to teach Jewish chefs how to cook with cannabis. Lox isn’t the only Jewish food Pollack is currently infusing with weed; he’s also trying his hand at matzah ball soup, made with cannabis-infused schmaltz. “Anything you can cook with fat, you can cook with cannabis,” he said.